Tony Stark is known throughout the world as many things: billionaire, inventor, Avenger. But mainly for being the Invincible Iron Man. Just when Tony is about to add his pizzazz to an international eco-summit in Ireland, someone close to him forces him to question his role in making the world a more dangerous place with his high-tech weaponry. But Stark doesn't have much time to reflect before an old enemy presents him with an even greater challenge: the assassination of all the eco-ministers, and Iron Man himself. 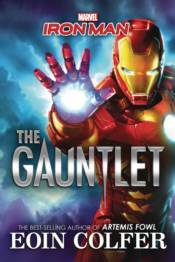 Just how invincible Iron Man is when he is stripped of everything remains to be seen in this breathless adventure by the best-selling author of Artemis Fowl.